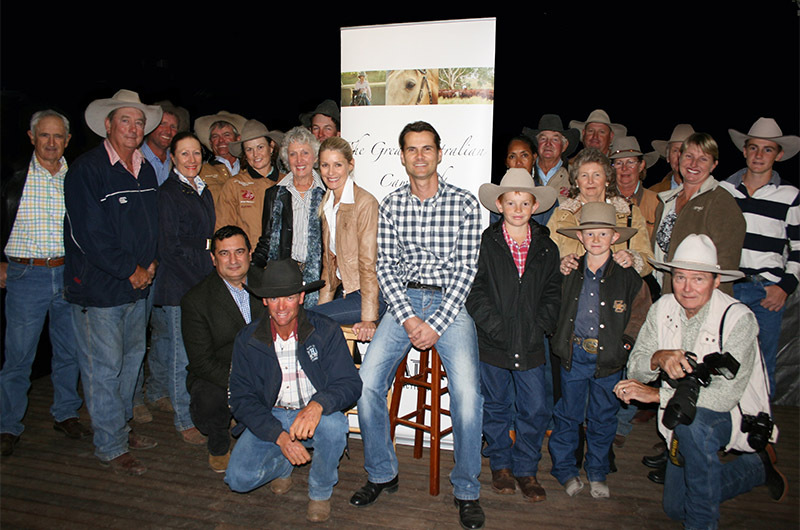 The Cast and Crew of “The Great Australian Campdraft” at the 2012 Warwick DVD Launch. After an incredibly successful Launch at Warwick amidst the famous Gold Cup Campdraft, the Special Edition Director’s Cut DVD of the Documentary “The Great Australian Campdraft” is now available for purchase. At over 53 minutes long, the DVD version of the film is more than twice as long as that screened on the ABC1 Landline Program in October 2012. Over 300 discs sold in the first weeks of release, and Palatine Productions have been receiving great feedback from both country and city viewers alike. There were plenty of happy recipients during Christmas 2012 as the packaged discs were sent to the far corners of Australia, from the Pilbara to Tasmania….. Included on the disc are four stunning bonus features, making the total viewing time over an hour and twenty minutes. A particular favourite is the full, un-cut historical raw footage filmed in 1935 by Fred Fairbairn in Clermont, Qld. It’s unlikely that any single piece of film could do a better job of showing the way Campdrafting was and still is a true part of life in the Australian bush! Special thanks to Neville Fanning and all the great people at The Warwick Show and Rodeo Society Inc. who generously gave us their time and support to hold the launch during the Warwick Gold Cup Campdraft week. “Outstanding!” Ben Maguire, CEO Australian Stockman’s Hall of Fame. “Really Enjoyed it….” ”Most impressed!” Sue Jones, Publisher and Editor, The Australian Campdrafting Magazine. “Loved it” Pete Comiskey, 18 Times ACA Champion Open Rider. “Didn’t want it to end.” Sean Dillon, ACA President. “Campdrafting’s Spirit soul and excitement are beautifully captured” Ashley McKay, ACA Founding President. CLICK HERE to view the trailer or purchase a copy or go to our Portfolio and Sale Page. “The Great Australian Campdraft” Special Edition Director’s Cut DVD.